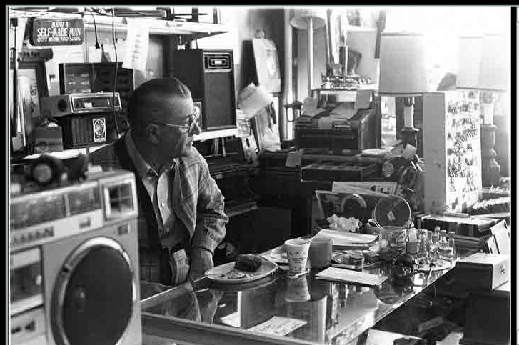 The Circle Square Second Hand Store opened for business in January 1969. Its founder, Ray Havranek, had frequented the Atlantic Hotel Bar Grill and was looking for a place to open a business that he could run by himself. The proprietor of the establishment, one Jack Kirkland, had fallen on hard times to the level that he cleaned out the till after each sale to keep his creditors (Montana Power, the IRS, the bank) from getting the money before he did. The big cat smile spread across the bo-hunk’s face and the cat’s paws reached for the wallet before Kirland could change his mind. The rest, as they say, is history. 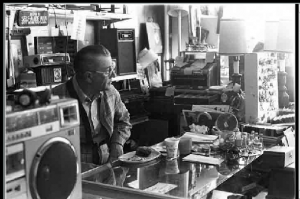 The location was perfect, being right around the corner from the big boys in the pawn & second-hand world, namely Woods & Pauls Second Hand on Alder Street. Tommy Woods and his partner, Arnold Helding, were none too happy about the intrusion, and openly proclaimed that Havranek wouldn’t last a year in competition with them. The fact that I’m writing this more than 30 years later in the store shows the level to which they underestimated the old fart pictured above. Havranek, an uneducated farm boy, had survived life in Depression Era Nebraska, Guadalcanal in WWII and marriage to a fiery schoolteacher who bore him five children. He had succeeded in the used car and real estate businesses, and his personal charm (drinking habits) made him quite popular with folk from all walks of life. With the help of his wife, Arlene “Second Hand Rose” Havranek, the store thrived. His greatest coup d’état being the salvaging of the Florence Hotel, an Art Deco classic that was undergoing bankruptcy. The person in charge of the bankruptcy was, of course, a drinking buddy of Ray’s. He told Ray to sell everything (out of the Florence Hotel) and the would split the profits. Now this was a 10-story hotel full of antique claw-foot bathtubs, crystal chandeliers and solid brass beds. Now if being given hundreds of thousands of dollars worth of merchandise, no money down, wasn’t good enough, his partner soon left town and never came back for his cut. Plenty good work if you can get it. Well, all good rides come to an end and time marches on. Eventually Ray got sick (cancer), allowing me and a string of ex-partners to come to the store. As of yet, no one has given me an Art Deco hotel to salvage, but I have done OK rummaging around for treasure. Along with housing what one local journalist has described as the innards of a monster that swallowed the 20th Century whole, the store has hosted (willingly and not so) performance art, live music, comedy and was the site of a PBS special feature on the United States of Poetry after featuring a poem by local, Sheryl Noethe. So if you’re ever in town, stop by and catch the show.